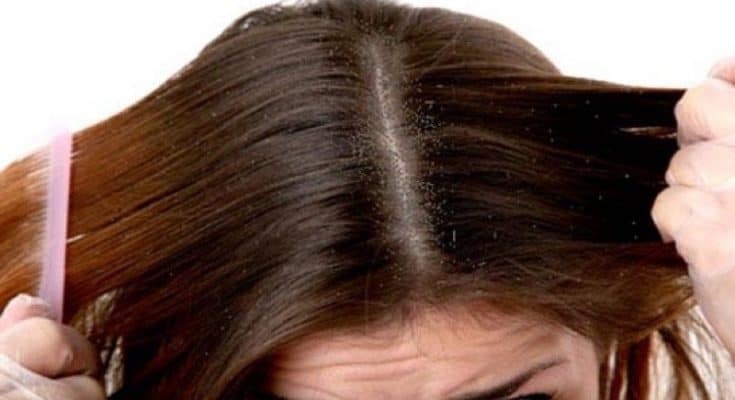 Dandruff is one of the most irritating hair problems. It is annoying and painful, and at the same time, visible. If you have dark hair, dandruff symptoms will be easy and extremely visible. Dealing with chronic dandruff all year round can be challenging. Of course, nobody wants to accept the condition as normal. With that in mind, what can you do? While there are many home remedies for dandruff, today we will talk how to use apple cider vinegar for dandruff issues. When it comes to ACV, a lot of people use it only for adding flavor to the salad. But apple cider vinegar is capable of much more. Not only it helps dandruff, but it can also help with other hair and skin problems. For now, let’s focus on dandruff. 1 How does Apple Cider Vinegar help with dandruff? 2 Are there any side effects of using apple cider vinegar on hair? How does Apple Cider Vinegar help with dandruff? Let’s list some of the benefits of apple cider vinegar. And of course, explain how they are linked with your dandruff issue. Are there any side effects of using apple cider vinegar on hair? Every remedy has its benefits, but also its downsides. In that manner, when it comes to apple cider vinegar, the remedy is generally considered safe. However, if you use too much of it, apple cider vinegar can strip your scalp from its natural oils. Therefore, the moment you feel your scalp is getting too dry, pause the ACV treatments for a while. Another issue is that while using apple cider vinegar, you have to remember to oil your hair regularly. If not, it can become brittle and prone to breakage. Best way to prevent this is by using ACV in conditioning hair pack. If you have just a mild dandruff problem, the simplest way to tackle it is to massage your scalp with apple cider vinegar. This massage will allow ACV to penetrate into your follicles, remove any build-up, and balance pH value of the hair. All you need is just 3 tablespoons of vinegar. Gently massage the vinegar into your scalp, and then leave it to stay for 10 minutes. Wash with a mild shampoo, and then follow it up with a conditioner. Repeat the treatment once per week, or once per 2 weeks if your problem is not that serious. If you do not want to massage your hair with vinegar due to the smell and fear of not getting the odor out, you can try a simple rinse. For this remedy, you will need to dilute the vinegar. If your dandruff issue is serious and severe, you need to take the apple cider vinegar treatment to another level. Wash your hair before the treatment. Mix ¼ cup of apple cider vinegar and few tablespoons of water in a spray bottle. Slightly dilute the solution to reap the benefits of vinegar, but also get a little less harsh remedy. Spray the solution directly on your scalp, and then massage it for 5 minutes. Make sure to thoroughly coat the scalp. Wrap a warm towel around your head to lessen the smell of vinegar. This will also open your pores, allowing the vinegar to penetrate more deeply. Allow the vinegar to stay on your hair for 20 to 25 minutes, and then rinse with shampoo and conditioner. Repeat the treatment two times per week for severe dandruff issues. The beauty of vinegar is that the remedy is very versatile. This allows you to mix and match vinegar with other natural remedies for dandruff. One of those is tea tree oil, which also has antiseptic and antibacterial properties. And tea tree oil is also widely known as a remedy for dandruff. In other words, you are mixing two great ingredients for a potent remedy. Another ingredient you can combine with apple cider vinegar is baking soda. It works as a great cleansing agent. Use this remedy to scrub and exfoliate your hair and remove dead skin cells caused by dandruff. In addition, the remedy will balance the pH value of your scalp without stripping away natural oils. Chamomile is widely known as a calming agent. Rinsing your hair with a solution of tea and vinegar will give your hair golden glow, but also soothe your scalp. No more itching and irritation. These two ingredients can tackle almost any problem. Sore throat? Drink a honey and vinegar solution. Skin issues? And if you have dandruff issues, honey and apple cider vinegar is a potent combination to lock moisture into the hair shaft, keep your hair hydrated, balance pH, and heal your head. Both ingredients have antifungal and anti-inflammatory properties, maintaining the optimum health of your hair.